This recipe was first posted in 2009, this is a repost with better (?) photo and improved recipe. It’s cliché to start off by saying, “how time flies”… but I still have to say… time really flies! I started this blog in 2008, when I was still a learning baker with a 3-Megapixels digital camera. Fast forward to 2012, I am now still a learning baker, but now armed with a DSLR and a trusty tripod, a birthday present from X. (: I know my food photography skills still have a long way to go – but I think the quality of the photos are slightly better than before… right?? Preheat the oven to 190 degrees Celsius. Grease a 20-cm (8-inch) square cake tin. Line the bottom of the greased cake tin with baking parchment and leave an overhang on two sides (for easy removal of the brownies later). Place the chocolate and butter in a heatproof bowl. Set it over a pan of simmering water (do not let the water touch the bottom of the bowl). Stir the mixture occasionally using a wooden spoon or a whisk, until all the chocolate and butter has melted. Remove the heatproof bowl from heat and set it aside for 5 minutes. Use a wooden spoon or a whisk, beat in one egg into the chocolate-butter mixture, until it has been fully incorporated. Beat in the second egg until it has been fully incorporated. Beat in the vanilla extract and caster sugar until fully blended into the chocolate-butter mixture. Sift the plain flour and baking powder into the chocolate-butter mixture and mix gently. Add in the pecans/walnuts and white chocolate if using and mix gently. Pour the batter into the prepared tin and bake for 25 – 30 minutes until the top is dry and the centre is just firm to the touch. The top may crack a little. The skewer-inserted-into-the-centre-of-the-cake test will not be accurate, so it’s all about judgement. Place the tin on a wire rack to let it cool completely. To serve, run a hot knife along the edge of the brownies and use the overhang of the baking parchment to lift the brownies out. Cut the brownies into 8 to 10 servings. Place the brownie on a serving plate. Dust with icing sugar and place a scoop of vanilla ice cream on top. Serve with chocolate sauce. 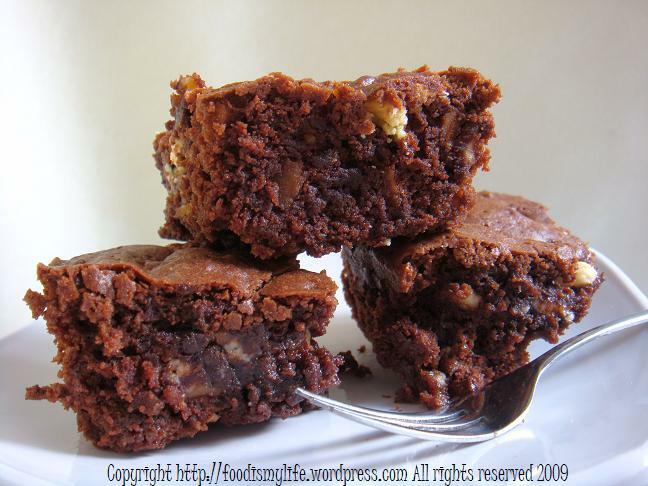 Hi Jasline, Thank you for sharing your brownie with us! It sure looks good, I would go with coffee for this! Hope to see you in our next Bake-Along! Have a lovely day! Love brownies and these look amazing. 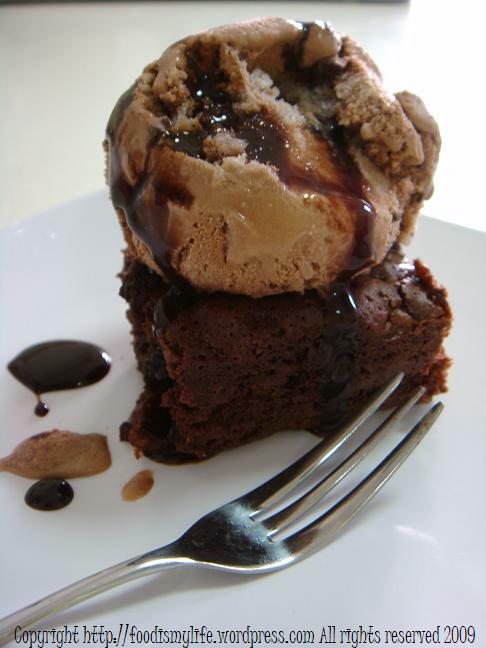 Really moist and fudgy… I can just imagine the taste! Thanks for sharing 🙂 I think it’s nice to look back at what you’ve done in the beginning and compare with where you are now. Zoe: Thank you! Thanks for hosting the Bake Along too! Hope I’ll be able to join the next one too! I think it is always good to have a classic and fail-proof brownies recipe always in my mind and I think your brownies recipe is a great “keeper”. hi jasline, now i can see the difference in using a dslr versus a digital camera..such dramatic improvement and your photography skills are superb. Though the one that you re making now looks a bit thin but who cares..they sound yummy to me..very nice!.btw, i just read above abt the 5 minutes chocolate cake..you must make that and show us! I have not really done an analysis of your photography skills from 4 years ago but as of today they are super. So you have a tripod? Great idea! Currently I have my little cannon camera that most generally has some type of food, or flour all over it. I can usually be spotted taking pictures with one hand while cooking with the other. Yummy chocolate brownies!